The railroad itself dates back to 1864 and is part of the charm of the experience today, which involves guests relaxing to the clack-clack of the wine train conveying them along the Napa Valley wine train’s routes—most of which run 36 miles, round-trip, to St. Helena and back. There’s never a bad time of the year to sample Napa Valley’s abundance of delicious wines or to soak up its verdant, sun-kissed beauty while exploring local wineries like Robert Mondavi and Domaine Chandon. The winter months, however, are particularly rewarding for visitors who will be met with the same natural beauty that takes your breath away—albeit just with fewer crowds, the sweater weather likewise forcing you to cozily bundle up while huddling around, say, a fire pit to sample a flute of sparkling Champagne. For an even more picturesque experience, one local offering especially worth consideration is the Napa Valley Wine Train—tour packages for which can be booked year-round but which has been described as offering one of the most beautiful winter train rides in the country. The Napa Valley Wine Train headquarters lies 50 miles north of San Francisco, at McKinstry Street Station, and its early 20th century Pullman coaches whisk passengers along on a number of different routes, including as part of three-hour tours that start at $150 as well as six-hour rides starting at $250 that offer combinations of meals, wine tastings, and winery tours. Among the variety of tour options, Napa wine train packages also include special holiday, New Year’s Eve, Valentine’s Day and even murder mystery offerings. This year will mark the 30th anniversary of the wine train, which started its gourmet dining service back in September 1989. The railroad itself dates back to 1864 and is part of the charm of the experience today, which involves guests relaxing to the clack-clack of the wine train conveying them along the Napa Valley wine train’s routes—most of which run 36 miles, round-trip, to St. Helena and back. Depending on which package you’ve chosen, you can also stop at celebrated wineries along the way and enjoy a sumptuous four-course meal. The Napa wine train accommodations includes Honduran mahogany paneling, brass accents, etched glass partitions, and plush armchairs, an old-fashioned throwback to the heyday of luxury train travel in the early 1900s. 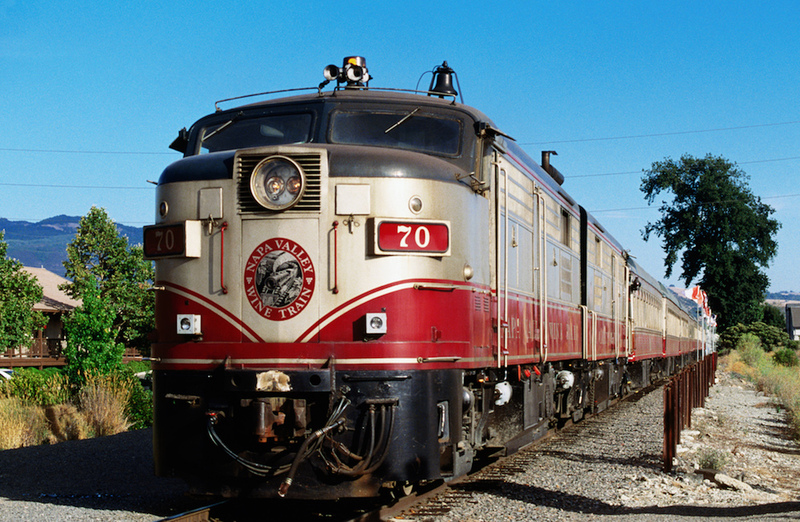 “Since acquiring the train, we’ve strived to take the guest experience to the next level, consistent with the maturation of Napa Valley,” said Napa Valley Wine Train co-owner Scott Goldie. “This not only includes refurbishment of the train, but a fresh and local upgraded food experience and many exciting new tours.